We are glad to announce the new DXN Ganoderma Coffee Capsules in Europe. 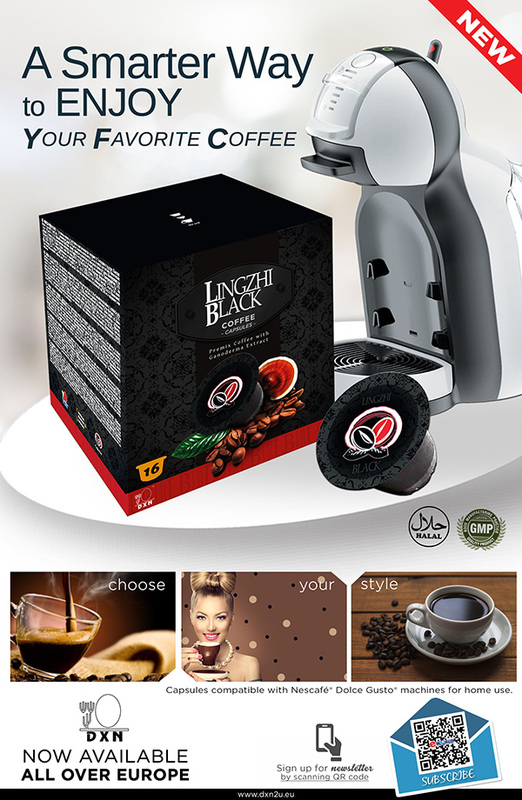 DXN Lingzhi Coffee 3 in 1 EU and DXN Lingzhi Black Coffee are from now on available in capsules. Q: What kind of coffee machine can it be prepared with? A: The capsules are compatible with Dolce Gusto® machines for home use. (This trademark is not owned by DXN INTERNATIONAL or companies related to it. Tip: The best choice is a type where you can control the water dosage – so you can set the water amount according to your taste. Q: What kind of coffee could I make from these capsules? 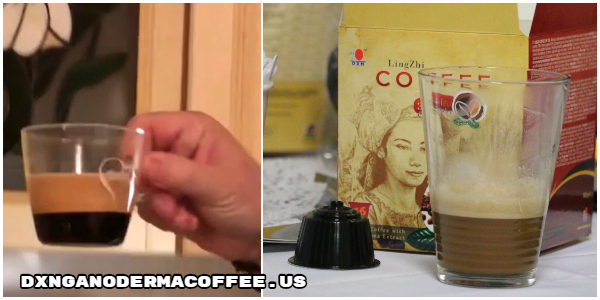 A1: DXN Lingzhi Black Coffee Capsule – 2 units = 50 ml water (1 unit = 25 ml water) – So we get an espresso type of black coffee. You may use any sweetener for flavoring. So we get a cappuccino type of coffee because it contains non-diary creamer and sugar beside the coffee and Ganoderma. Q: Is the Ganoderma ruined if we put water over 80°C in it? A: This coffee machine is not for freshly ground coffee but for instant one, so it does not work on 100°C. The water that runs through it is around 80 to 85°C. So it does not impair the Ganoderma. Enjoy your instant coffee with Ganoderma extract in capsules and have a wonderful day! Q: What is so special in these coffee capsules? A: After preparing it, a wonderful thick cream appears on the top. This is due to the carbon dioxide which is released while preparing it. This is because the coffee bean oils are still out-gassing from the roasting process. Naturally-processed beans will often produce the best crema. This Crema also depends on the ratio of arabica and robusta. These coffees contain 70% arabica and 30% robusta. The strong presence of crema indicates a quality, well-ground coffee. Q: Who is the coffee capsule best for? A: Whoever has this type of coffee machine or would like to purchase one because he likes to prepare his coffee simply and comfortably and likes the crema layer on the top. 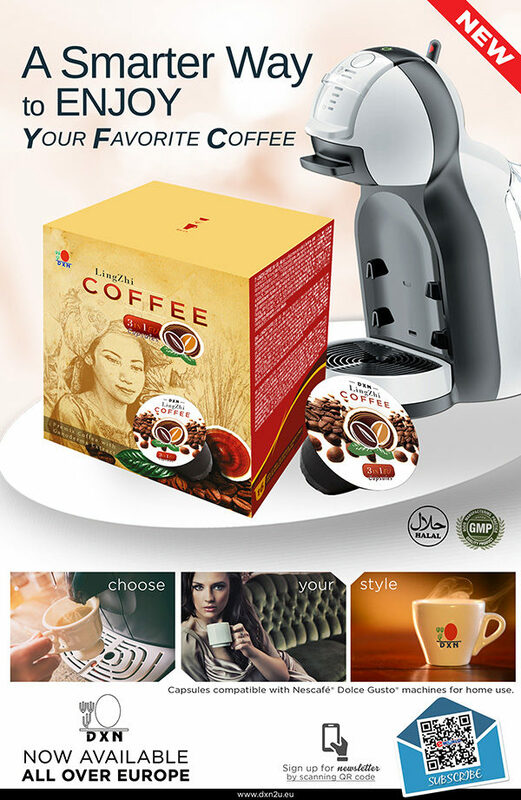 DXN Ganoderma coffee capsules can only be purchased in Europe. You can choose from 7 different types of instant coffees, one filtered, Turkish type version with sugar and from 4 types of Megapack (400 g and 1 kg portions). So everyone can find the best for him in the supply of DXN.